If RMU were to move conferences, where would they go? With the new UPMC Events Center being built for the 2018-19 basketball season, the idea of RMU leaving the NEC is now greater than ever. But if they were to move, where would be the best fit? Based on what happened when Monmouth decided to move conferences in basketball, leading to their exile from the Northeast Conference, the criteria of the move is one which would provide a greater level of competition to the Men’s and Women’s Basketball programs while also finding a conference which would accept Robert Morris’ struggling football team. 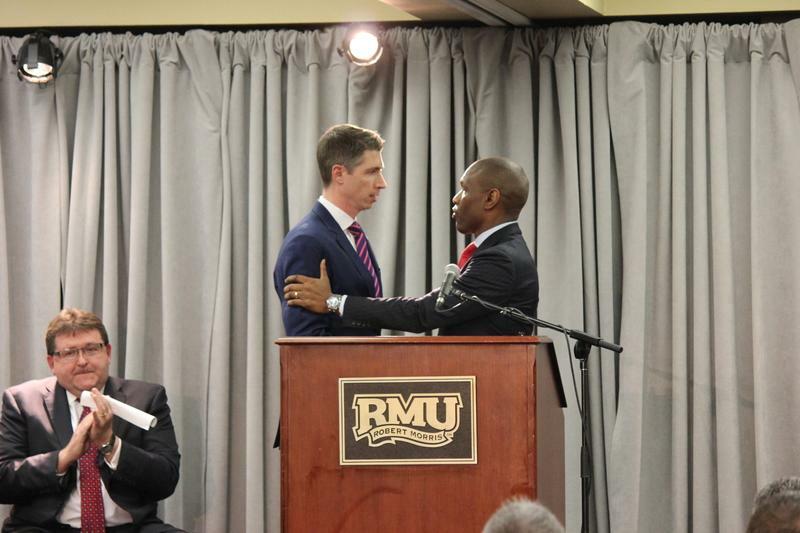 Based on the location and financial abilities of Robert Morris being able to travel to certain conference opponents, there are three potential possibilities for an RMU move that would allow for both football and basketball to make the move. Based out of Center Valley, Pennsylvania, the Patriot league has a total of ten full members and three associate members. They are located in a region similar to that of the NEC with the farthest team from Moon Township being Boston University. In terms of Men’s Basketball, Bucknell is currently the top team in the Patriot League with an 11-2 conference record and a 19-7 overall record. Robert Morris has played Bucknell ten times in their history and losing seven of those matchups including once in each of the past two seasons. They have not been able to secure a win against the Bison since 2004. 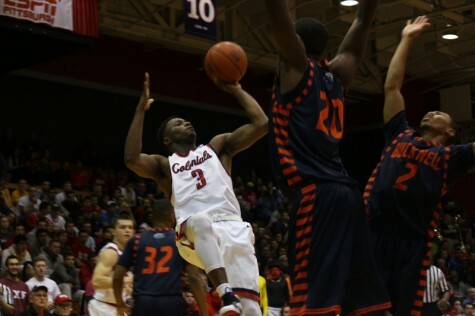 Kavon Stewart going up for shot in their most recent home match up against Bucknell back in 2015. For the rest of the Patriot League, however, the competition resembles closest to the NEC, teams that can compete, but none that will be expected to make deep NCAA tournament runs or even be ranked. Familiar teams to Robert Morris Hockey such as Army and Holy Cross, along with a foe the Colonials fell to by the tight margin of 64-58 in Lehigh. Football may be a different story, a team which already struggles traditionally would see a far more difficult time even garnering a win in a conference which sees multiple teams with the ability to compete in the non-conference. Lehigh this season saw themselves win 9 straight games after dropping their first two and competing with teams like Villanova, a consistent threat to make a deep playoff run in the FCS. Football will continue to be the biggest concern when it comes to switching conferences. Perhaps a change in their fortunes for upcoming seasons will make the possibility of a conference change to become more likely. Similar in caliber to the Patriot League when it comes to basketball teams, the conference this year is dominated by University of North Carolina Wilmington and Charleston. But in third place, only two games back from first place in the conference in Towson, a team the Colonials beat 67-66 in the championship of the Towson Division of the Barclays Classic. With the improvement in the overall records of each team compared to the NEC the Colonial Athletic Association would be a step up for the Colonials, which would help in potential being seeded above a 15 seed in the NCAA tournament while Robert Morris would also be able to compete in basketball. In terms of Women’s Basketball, Only three teams in the conference have a better overall record than Robert Morris brings into this current season and only one carries a winning streak longer than the current 8-game win streak which head coach Charlie Buscaglia has led his team to. Football would then be heading to the conference of the current national champion James Madison Bulldogs. But with teams like Rhode Island, who took one of the worst losses in college football this season in their 84-7 loss to James Madison, Robert Morris may not be a cellar dweller in this conference. With the caliber of opponents like Villanova and the University of New Hampshire allowing for better recruiting. 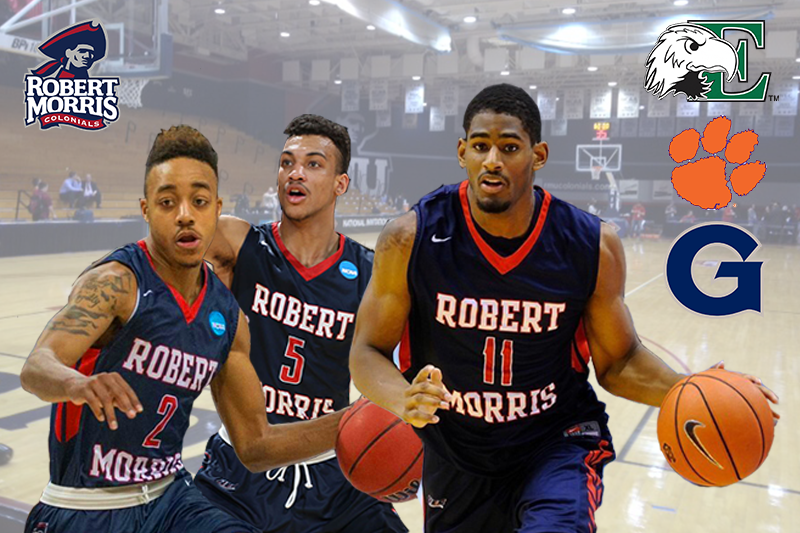 A more southern look for RMU but one that is still possible within their travel constraints. The cream of the crop in the Big South is Liberty University, UNC Asheville and Winthrop. These three have been nearly unstoppable in conference play and expect it to be one of those three punching their ticket to the big dance in March. But it looks as though Liberty University is on their way out. The university just filed their NCAA waivers which will allow them their football team to make the move from the Football Championship Subdivision(FCS) to the Football Bowl Subdivision(FBS) which could mean that their basketball team could be on the move as well. Without Liberty to clog up the top of the conference, there is a wide open spot where the Flames left for the Colonials to come right in and fill. The conference would look for a team like Robert Morris, who traditionally is very successful in basketball, to maintain the level of competition between the teams without Liberty University in the mix. In September 2016, Football in the Big South announced its expansion to continue the growth of football in the conference since its establishment in 2002. 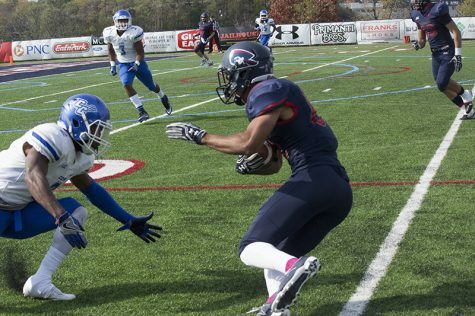 Robert Morris football would be a perfect addition to allow the team to compete with many schools that have very young programs with budgets similar to that of the Colonials. While the move to more southern teams would allow Robert Morris to continue recruiting from the southern states which have proven key to their success. With the loss of running backs coach Myles Russ to Keiser University in Fort Lauderdale, FL, RMU needs a new recruiting tool to states like Florida. Florida has produced Colonial impact players such as Marcelis Branch, Joe Uhatafe and Gerald Ferguson. A move to the Big South could see a big impact on the type of talent which comes to Moon Township. The entire purpose a conference move for the Colonials would be in order to put the team in a place where they could continue to grow as a program but also still be able to be competitive, keeping the idea of annual NCAA tournament appearances a possibility. With that being said, this move will be more heavily considered on how this affects both the Men’s and Women’s Basketball teams rather than football. Those are the programs which see the more consistent success than football. This is not saying that football will not see any sort of improvement with highly touted recruits coming to play on an already talented defense and an offense set to improve under 2nd-year offensive coordinator Mike Miller. But for now, these moves will be under consideration for what conference will allow the basketball program to reach new heights and that will also accept the Colonials football team into the conference. And under those conditions, the best fit for Robert Morris athletics to make a conference shift would be the Colonial Athletic Association. The competition as a whole is better than in the NEC, with teams that the Colonials have already proven they can compete with and even defeat. 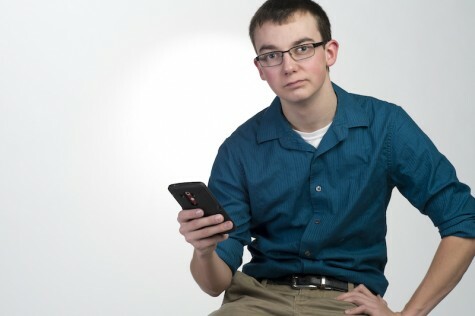 The better competition would bring in stronger recruits and perhaps entice coach Andy Toole to continue his stay in Moon Township after his contract expires in 2021. 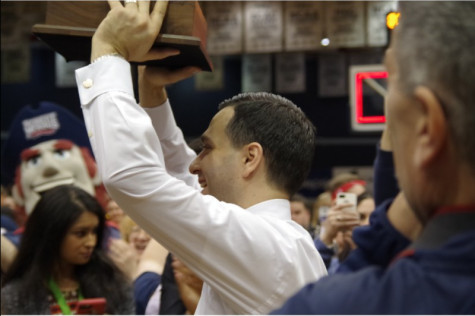 If Coach Buscaglia continues to see the same level of success that he has in his first season, these two programs should continue to be a force and perhaps, for the first time in the program’s history, receive seeding in the NCAA tournament beyond a 15-seed. This would also not be a total failure of a move for football. 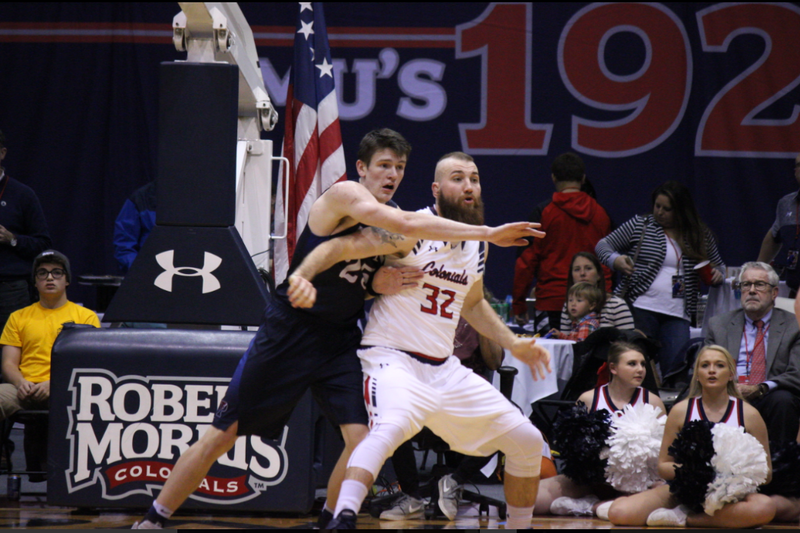 With teams like Rhode Island and Elon, there would be opponents in which the Colonials should be able to defeat each year. Improving a program which has only seen the postseason twice since 2000. Any sort of change may benefit a program which as a whole is trying to change their culture. This move still may be long ways away as the UPMC Event Center has not even begun its construction. But for future generations of Colonials, conference realignment should not be too far away if the program continues to trend in the right direction. Instead of looking at other conferences, RMU should be increasing their influence in the NEC, where the more likely school to leave might be Central Connecticut simply because the next realignment wave will probably impact the coast more than Pittsburgh. 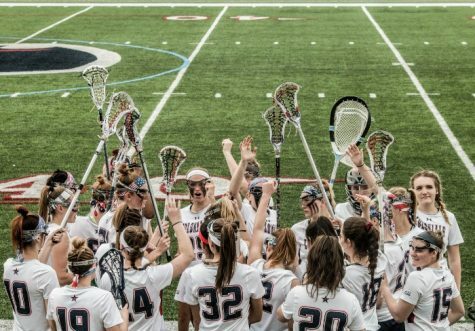 That would present RMU with an opportunity to solidify a four-school “Southwestern Bloc” in the NEC, alongside current members St. Francis and Mount St. Mary’s, with Shepherd University from eastern West Virginia moving to the NEC from Division II. With three relatively close rivals, and easier travel arrangements for the league as a whole, there would be no need for RMU to look elsewhere. The old money Patriot League would never accept RMU, the Big South is too far away, and the CAA too spread out.